Call or email for prices for items, such as woodworking tools, that are not listed. $40 minimum order to sharpen on-site at your location. 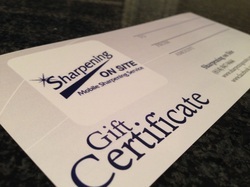 Sharpening on Site gift certificates make the perfect gift for the cook, gardener, or landscaper in your life. Gift certificates are available for purchase at Celebrate Local at Easton and City Folk's Farm Shop in Clintonville.